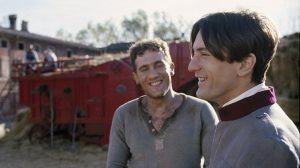 A rare opportunity to see Bertolucci’s massively ambitious political saga, set on a farm in the Po Valley between 1900 and 1945, in its full, five hour plus form. The film chronicles the fortunes of two young men, one the son of a landowner, the other a worker. Morricone store, Storaro cinematography, and performances from Robert De Niro and Gerard Depardieu, Donald Sutherland and Dominique Sanda, Burt Lancaster and Sterling Hayden, all magnificent.